Free Shipping Included! Sparmax Achieve TC501N Compressor by Sparmax at Stickman's Blog. MPN: AIRCOMP2. Hurry! Limited time offer. Offer valid only while supplies last. The Sparmax Achieve TC-501N is a zero-maintenance, oil-less piston compressor for those looking for minimal moisture or in a high humidity location. 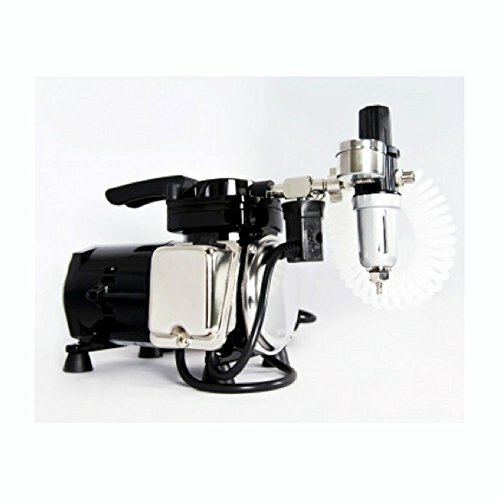 The Sparmax Achieve TC-501N is a zero-maintenance, oil-less piston compressor for those looking for minimal moisture or in a high humidity location. It performs extra filtering effects resulting in clean air with much less moisture. It has a 1/8 HP motor capable of 12-16 LPM. Included are: a braided airline, Cobra-coil PU condensation airline, pressure regulator, moisture trap, gauge set and adapters for other airbrush brands. The preferred compressor for Copic Markers and Copic Airbrush Systems. If you have any questions about this product by Sparmax, contact us by completing and submitting the form below. If you are looking for a specif part number, please include it with your message. © 2019 - stickmans.net. All Rights Reserved.